Liebherr has upgraded its 750 tonne LR 1750 crawler crane into the LR1750/2 with increased capacities and H-boom configuration. The boom changes are similar to those already incorporated in the LR1600/2’s ‘H’ or Heavy boom configuration, which include strengthening the main boom and extending the derrick boom by seven metres to 38.5 metres. 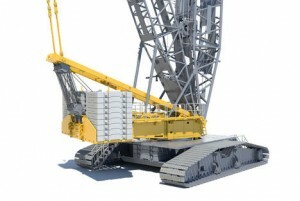 The company claims that the changes have increased the crane’s capacities by up to 30 percent in some areas. The LR1750 suspended ballast trailer has also been modified to include a hydraulic drive system, while work at height safety features have been revised through the machine, with additional platforms/access points added as well as improved guardrails. All existing LR1750 components can also be used on the new LR1750/2, which will of course be an advantage for current LR1750 owners.